You’ve done all you can to improve your golf game from mechanics to new clubs. You stand on the tee box and smash the prettiest drive of your life and then…plop! No, not the pond, it’s from your golf ball embedding itself into the soggy, mushy fairway, robbing you of 40 additional yards that would have landed you a shot at an eagle. If you have ever stepped out on a golf course you have probably heard the terms “fast” or “slow” used to describe how fast or slow the ball rolls on the carefully manicured grass. “Slow” greens are usually caused by an increased amount of moisture soaking through the grass (or taller grass) which gives the ball a slower roll. Conversely, “fast” greens usually mean the grass is drier (or freshly cut) and the ball is likely to roll fast. So how does URETEK fit into this story? Just as critical as irrigation, a golf course must have proper drainage so that the water doesn’t stand on the greens or in the fairways. Drainage issues are what prompted a premiere golf course in southwest Houston to contact URETEK ICR Gulf Coast. At this club, large drainage pipes located in the middle of the fairways experienced leaks in many of the joints, allowing water to flow out and base soils to be eroded away. In short, playing conditions were suffering, and they weren’t going to get better on their own. And, since these problem areas were located directly in the area of play, a non-intrusive solution was sought. URETEK ICR Gulf Coast, headquartered in Houston, got the call from the golf club’s consulting engineer. To precisely diagnose the extent and exact source of the leaks, URETEK utilized a state-of-the-art video recording system to record conditions throughout the 200’ long pipe using a high resolution video camera. 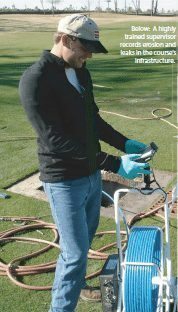 This system allowed URETEK to pinpoint leaks without excavating or destroying any part of the golf course. Locating the pipe leaks and sealing the leaks are two different tasks all together. Traditionally, the answer would be to dig up the infrastructure and replace the compromised sections of pipe — an unacceptable (and expensive!) alternative given the site conditions. The modern, proven technology of URETEK offered just the right solution. Utilizing 1.0” diameter drill stem and copper tubing, closed cell, expanding polymers were injected at the precise location of the leaks, quickly and effectively sealing the infrastructure. Priced right, this long term solution meant virtually no interruption to golf course operations and, most importantly, predictable fairways for the 25+ handicap golfers out there.